Average Jane Crafter: Ike-a-saurus update & Thank you! WOW! The response to last week's post about Baby Ike was incredible. I've had loads of emails offering donations and support, and offering items for our silent auction. There have also been lots of fantastic items posted on Etsy with proceeds going to Ike-a-saurus. If you are wanting to donate to baby Ike, this is a great way to do it. You get to send funds to Ike, show support to the crafters who are donating to Ike, and get a litte something special for yourself. You can't lose! I'll be posting a final update of all the crafty donations once they are all in, but for now I'd like to post a shout out to folks who have offered items on Etsy for Ike. Please check them out, support them, and tell them "thanks" for helping sweet Ike. Susan immediately stepped up to the plate for Ike and offered *all* the items in her Etsy shop for the Ike-a-saurus fund. Amazing! 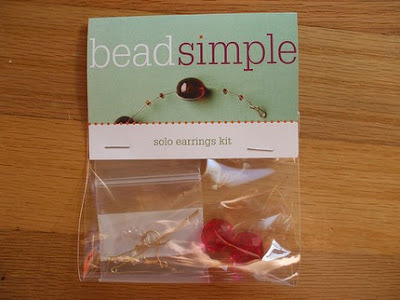 She's already sold tons of her Bead Simple jewlery kits, but there are a couple left if you want to grab one while you can. While you're there, be sure to check out info on Susan's new book, Button it Up, and tell her thanks for being so generous! What a perfect name for a business helping out Ike-a-saurus! 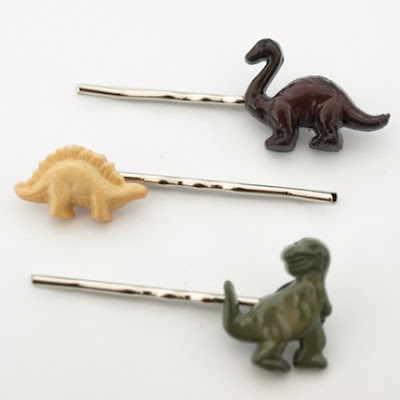 Andreanna has donated the sale of these super cute dinosaur hair clips for Baby Ike! And it appears Ike's cause has gone global: Adreanna is in Lenzburg, Switzerland! Wowza! Timary is an Austin crafter and makes beautiful crocheted items. 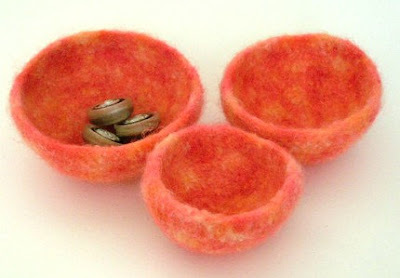 Her crocheted, felted, nesting bowls were a huge hit with Diane when I visited her in Portland last summer. She's designated five items in her Etsy shop (including some nesting bowls!) for Baby Ike. They are bright and colorful and super cheery - be sure to check them out! Tina is also right here in Austin, and she and her husband, Dave, are incredibly creative and talented. They've offered up two items in their Etsy shop for Baby Ike. 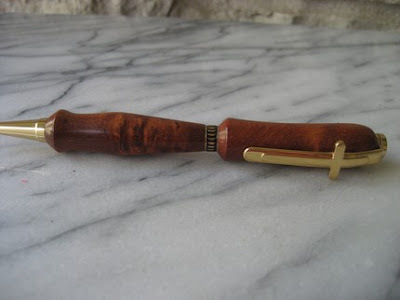 They are beautiful pieces that are hand crafted and lathe turned. Gorgeous! FaerieRebecca has offered a gorgeous Waldorf doll in Ike's name. 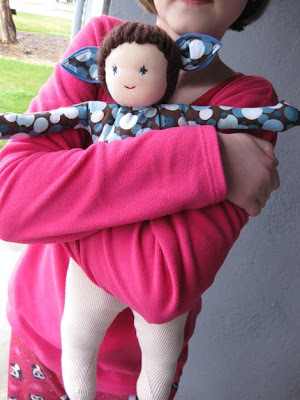 Her dolls look gorgeous and cozy and would be well-loved by any child. There have also been loads of people who have blogged about sweet Ike and have helped spread the word. Here's a list I have going so far (from my crafty peeps) - if you've blogged about Ike and I've missed your post, please shoot me an email at averagejanecrafter[at]gmail[dot]com and I'll get it listed as soon as I can. Thank you so much to all the people who have offered up their Etsy items for Ike and who have blogged about the cause. I can't tell you how much every tiny bit helps. It's been amazing to see so many "tiny bits" come together to forge a great big huge helpful lot for this sweet family. Stay tuned for more shout outs as items come in for our big silent auction, and stay tuned for more information about a local crafty event I'm trying to put together for next month. Thanks again for all this support. Please keep spreading the word, and keep up with the Ike-a-saurus cause on Ike's web site, and with Kari's updates about Ike's condition on her blog. The doll is AMAZING! I am so inlove with it! It sure is THE GREATEST gift any child could want! I want one myself and I am by far not a child :) Great post! Can't take the smile off my face.